Compass Commissioning and Design has completed its green|light Certification. 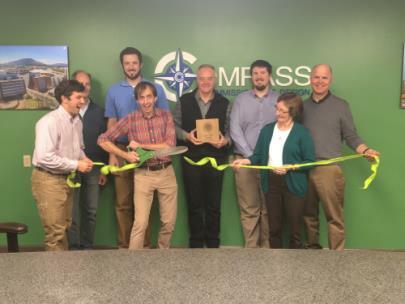 A green ribbon cutting ceremony was held in celebration of the center’s completion of the green|light program and their continual efforts in sustainable living. As a program of green|spaces, the green|light mission is to work towards sustainability by progressing ways of life and business in Chattanooga. Their focus is locally-owned businesses in the Chattanooga area with an interest in improving their environmental impact by redirecting everyday policies and practices towards a culture of sustainability while also enhancing employee attraction, public image, cost savings, and environmental stewardship. The program tailors a step by step sustainability plan to businesses of all sizes. Opened in 1996, Compass Commissioning and Design focuses on exceptional services for their clients, offering services in building commissioning, HVAC and BAS design, along with general operation and maintenance efficiencies. A founding member of green|spaces, Compass CX continues to support the mission through their sustainable business operations and community outreach. In their efforts toward green|light certification, Compass Commissioning has installed a 12 kW solar panel array that will make their office a net-zero energy building, replaced their building’s aging roof with a high-reflectivity white roof and additional insulation to reduce the building’s HVAC requirements, installed a garden of native and adaptive plants in areas of their property that had previously been uncovered soil, installed a rainwater harvesting system for both irrigation and to reduce their impact on the stormwater system, formalized a company wellness program and built an on-site fitness facility for employee use, and redrafted their purchasing policies to ensure that they are sourcing environmentally responsible office supplies and equipment. Once engaged, green|light tells a business’s story by creating a personal eco-policy manual unique to each business, custom signage, marketing, and design work, a green office checklist and a variety of sustainable needs resources. All of these evaluate all policies to save both money and energy. Chattanooga Area green|light Certified businesses include: EPB, REV Centre for Optimal Living, AEED, Chambliss, Chattanooga Zoo, Crash Pad, Flying Squirrel, Kelly Subaru, Lupi’s Pizza, Office Furniture Warehouse, Real Estate Partners, River City Company, Ruby Falls, Sportsbarn, Strand Salon, University of Tennessee Chattanooga, Whiteboard, and REV. Current Greenlight participants include: Kyle House Fitness, Mad Priest Coffee Roasters, Niedlov’s Breadworks, City of Chattanooga, Crabtree Farms, Reflection Riding Nature Center and Arboretum, Chattanooga Choo Choo, Humanaut, 5th Dimension Construction, Elea Blake Cosmetics, Yoga Landing, Calamansi Cafe, CPR Wrap, Bridge Financial Planning, SPOT Venue, Embargo 62, Hummingbird Pastaria, and The Blue Plate. For additional information about green|light or to get started with a company’s sustainability plan, contact Kelley Cureton at 648-0983 or kelley@greenspaceschattanooga.org.